In October, I watched the ashes of my uncle go into the ground. Right next to the ashes of his mother, my grandmother. In my front garden are the ashes of my mother-in-law and father-in-law. A tall pear tree used to shade them, now it is a place where their grandchildren tumble. On a hillside in North Carolina my father’s ashes are buried next to many other faithful women and men. He has most likely become soil by now, and fed the vines and trees that shade his visitors. 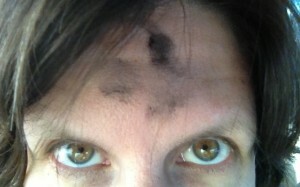 Today, I will have ashes on my forehead to mark the start of a season of penitence. It is a time for self-examination, repentance and renewal of faith–and the spiritual practices that encourage them. But for me it has also become a time to remember not only that I will become ashes and dust and earth some day, but that many I love already have. Ashes remind me of my mortality, and also of the mortals who have inspired me with their faith, their struggles, and their utter need to be connected through love to others. They are my cloud of witnesses. For the rest of Lent, in addition to repentance and renewal, I’ll be joining the fun and snark of Lent Madness. But the saints from my family, those who have wrestled with God and gone before me, will inspire me to think about my own life and relationship to both the divine and the mundane. And while Easter is still weeks away, the alleluias banished and buried, I will see a little resurrection in the life of their heirs, my children. Much like the weekly suspension of Lent we have on Sundays, it is not only the realization of mortality that inspires repentance, it is also the hope of renewal. There is a cycle that completes the ashes to dust to earth…and it is new life. In my garden, on a hillside, in my family, and throughout creation.